Living a Fit and Full Life: Recipe for the Easiest Pot Roast You'll Ever Make Using Jones Creek Beef! Recipe for the Easiest Pot Roast You'll Ever Make Using Jones Creek Beef! What sets Jones Creek Beef apart is their high level of commitment toward doing what is best and right for each animal throughout its lifetime. The way they raise and handle their cattle is of utmost importance in providing tender, flavorful, and nutritious beef to their consumers. They take great pride in their stewardship over their land and livestock. Jones Creek Beef wants you and your family to experience Better Beef, Better Flavor. 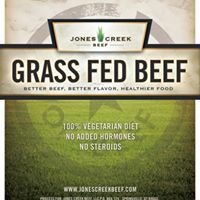 Jones Creek Beef Grass Fed Rump Roast is absolutely the most tender roast I've ever tasted and a must have for your pot roast recipes! Recipe for the Easiest Pot Roast You'll Ever Make! Place the roast in your slow cooker and add enough water to cover the roast. Add potatoes and carrots into your slow cooker. Add onion and garlic to the slow cooker. Set the slow cooker on low and set the timer for 6 hours. Make sure you check internal temperature before you serve. Your roast should be very tender and all vegetables should easily poked. You'll need this for my next recipe creation coming soon! Click HERE to find a store near you that sells Jones Creek Beef! Click HERE to learn more about Jones Creek Beef! Follow Jones Creek Beef on social media!